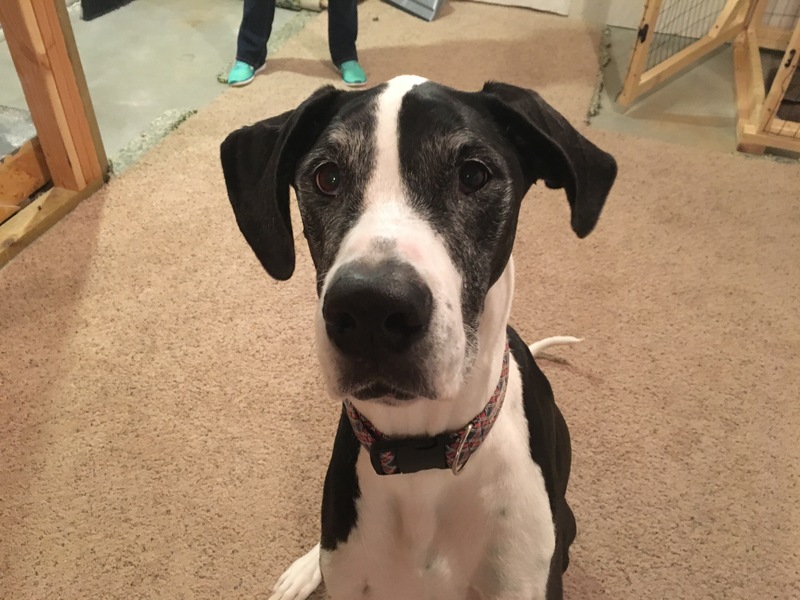 Thira is a six-year-old Great Dane who lives in Papillion Nebraska. Her guardians booked a dog obedience training session with me to stop her from getting in people’s personal space, getting over excited, not coming when called, charging the door and some anxiety. Thira showed good confidence and curiosity when I arrived for the session; barking an alarm but not getting overly worked up. Her guardian on the other hand, engaged in a behavior that likely intensified Thira’s reaction to guests arriving at the door. I sat down with Thira and one of her guardians to discuss the situation while we waited for her husband and children to arrive home from school. I knew some basic dog training and behavior issues were on deck, but I wanted to get a sense of what issues were the most pressing. I normally like to ask my clients how I can help them, but in this case Thira decided to give me a visual demonstration herself. I cannot tell you how many times I have had a client tell me that something that their dog does does not bother them, but they would prefer the dog does not do the same behavior to other people. But the way that we interact with our dogs is teaching them how they should interact with all other humans. So by not disagreeing with Thira’s invading of personal space, and instead petting her when she did so, her guardians were telling her that that was the proper way to engage with all humans. And because a dog thinks we are agreeing with whatever it is doing when we pet them, Thira’s guardians were literally training her to invade personal space by petting her each time she did so. I spent a couple of minutes explaining how the guardians can incorporate some rules and structure into the dog’s daily life to help it start to see and identify the humans as being authority figures. Because Thira did not have many rules or boundaries, she had gotten the impression that she had the same authority as her humans. When a dog thinks it it has the same authority as you, then listening to become is optional. In addition to suggesting some rules and boundaries, I showed the guardians how they can practice my Petting with a purpose philosophy. This simple, yet effective dog training technique will help them train their dog that she must ask for attention instead of demanding it. This will help her stop invading personal space and also help her see the humans as being in a leadership position. Because Thira got over excited when anyone rang the doorbell, I spent a couple of minutes going over a counterconditioning exercises that will help her stop behaving this way. If the guardians can practice this counterconditioning exercise a couple of times a day for the next week or so, Thira should stop barking and getting all worked up whenever she hears the doorbell ring. After wrapping up the counterconditioning exercise, I shared a set of escalating consequences that I have developed as a way of disagreeing with dogs for breaking the rules or engaging in unwanted actions or behaviors. I recommended that the guardians utilize these consequences anytime that Thira invaded their personal space or did anything else that was against the new rules. Because I derived these consequences after observing how dogs communicate and interact with one another, most dogs respond to them instantly. Thira was no exception. Next up was Thira’s habit of not coming when called. I had one of the family’s children join us as we formed a square formation around the living room. I spent a couple of minutes showing the family how to use a hand position and movement to entire Thira to come when called and how to reward her for doing so. Within a couple of minutes, Thira was trotting over to anyone who called her. One of the things that I always try to accomplish in my sessions is showing the dog’s guardians how they can incorporate a little bit of structure to routine day-to-day activities to help the dog develop and practice self-control. For dogs, whoever is in front is considered to be in the leadership position. So when I have a dog that thinks it has more authority than it actually does, I always recommend that the guardians ask the dog to practice a wait before actions or activities that the dog likes to engage in. Because Thira like to run up and down the stairs in front of her family, I spent a couple of minutes demonstrating how they could ask her to wait at the top of the stairs and only call her down after the humans had all gone first. I’d like to see the guardians practicing this wait exercise with Thira in other places as well. Asking her to sit before letting her in or outside, wait for permission to eat her food, or sit and wait before we throw the ball for a fetch are all small opportunities that will cumulatively help Thira develop more self-control and respect for the humans as her leader. The more the humans assume the leadership role, the less responsibility Thira will feel. As her perception of responsibility drops, her anxiety should subside. By the end of the session, Thira was no longer barking like crazy when the doorbell was rung, was showing much better respect for people’s personal space. In the few instances where she forgot and got too close, her guardians were able to utilize the escalating consequences to disagree with her. With a little time and effort at the petting with a purpose, incorporating a wait at various activities, enforcing rules consistently with good timing and the counterconditioning exercise, Thira’s guardians should be able to help her stop these unwanted behaviors in no time.